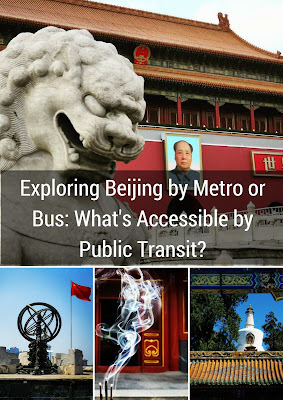 Is it easy to get around via Beijing public transit? Beijing is a surprisingly accessible city if you get a Beijing public transportation smart card. The network of metro stations and buses ensure that you can navigate the sprawl of China's capital with relative ease. After our difficult experience getting around by taxi in Hangzhou, China, we decided to focus on traveling by a combination of Beijing metro, buses, and walking so that the language barrier would be less of a factor. Beijing was our favorite stop on our trip to China and I chalk that up to the ease of getting around on Beijing public transit. Here are some ideas of Beijing points of interest that are accessible by public transit. To get started with public transit in Beijing, simply purchase a rechargeable transit card at any of the stations in Beijing. We even took the train from the Beijing Airport to the city although this involves a separate ticket. The ticket machines have an option to do the transaction in English to speed you on your way. Tap in when you enter the train station and tap out at the exit to calculate the fare. In most cases, the fare was a few yuan (less than $1 USD at the time of writing). You'll go through a casual security screen as you enter a station (walk through a metal detector and put your bags on a belt). Google Maps is blocked in China but it if you use a VPN, you can access public transit directions in Beijing. We used this technique to navigate in the city with Express VPN. SIDEWALK SAFARI SPOTLIGHT: It's easy to get around Beijing City on public transportation but consider hiring a private car and driver if you want to see the Great Wall of China. 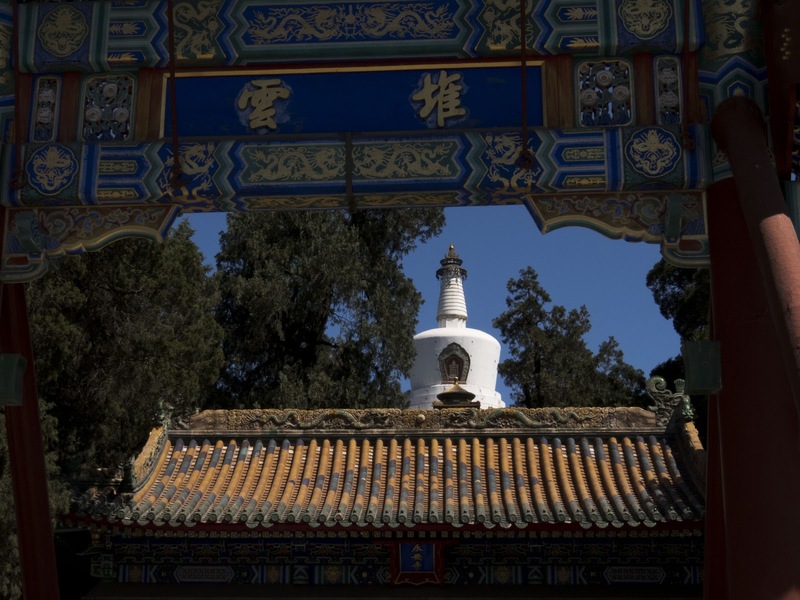 Beihai Temple is a gorgeous and idyllic spot just behind Beijing's Forbidden City. We took the metro to the Forbidden City station and then hopped on a bus that let us off just a few feet from the entrance gate. We spent a morning walking around the picturesque buildings. We learned that the number of figures adorning the roof of a temple is an indicator of its importance. 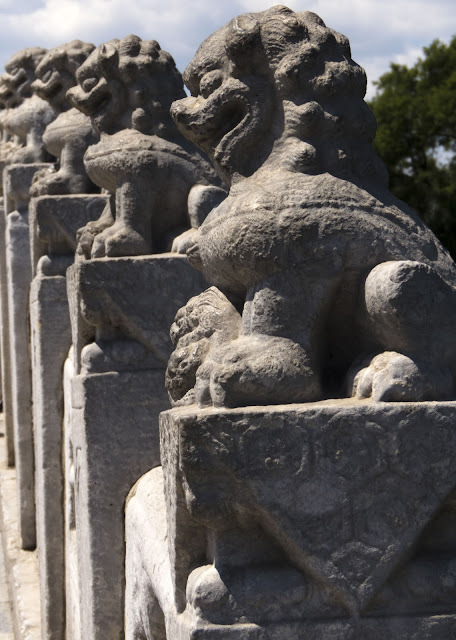 The temples at Beihai had between one and nine figures. Beihai Park sits on an island. Take some time to explore the surrounding area on foot and walk to Houhai Lake for a variety of choices for lunch. We love to walk and opted to continue on foot from Houhai Lake to Beijing's Bell and Drum Towers. 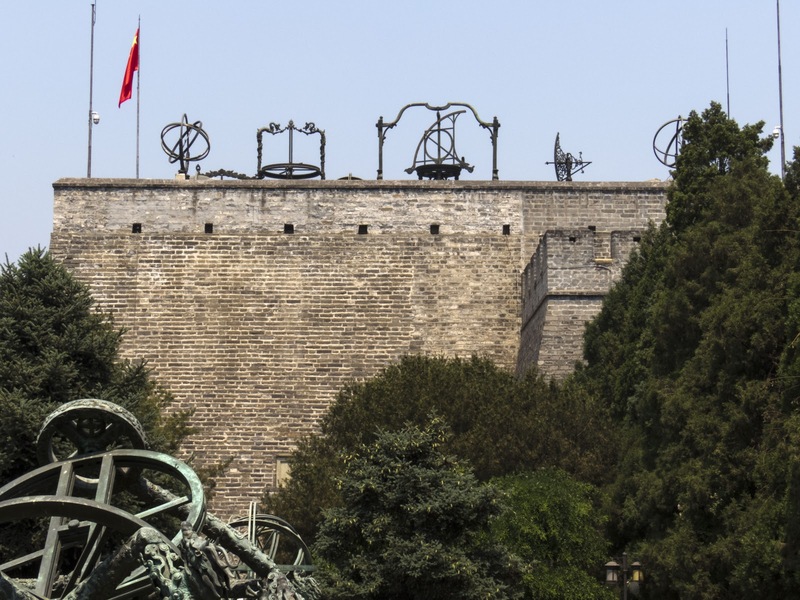 Climb the Bell Tower for sweeping views over the city. In the Drum Tower, we watched the traditional drum show which takes place at scheduled intervals. The Summer Palace in Beijing is situated on a picturesque lake. 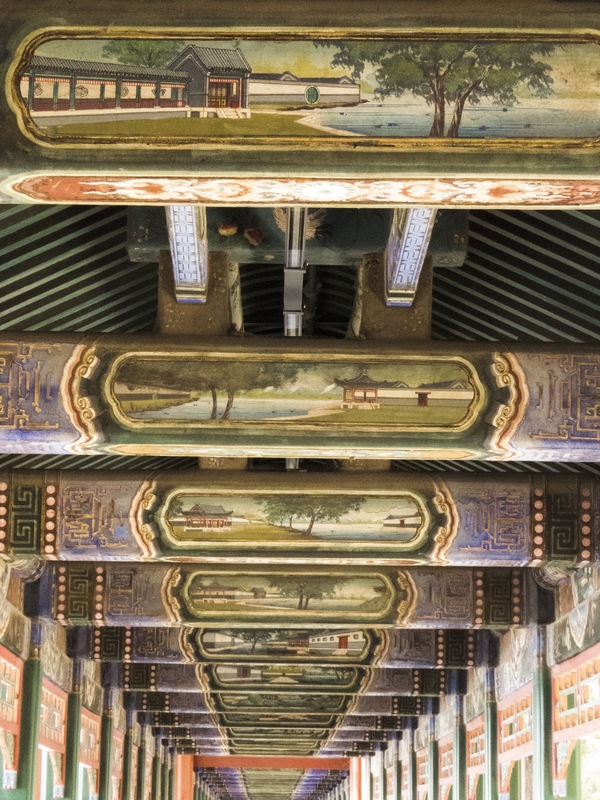 Historically, the Summer Palace was built by emperors and expressly for use by the ruling families of China. 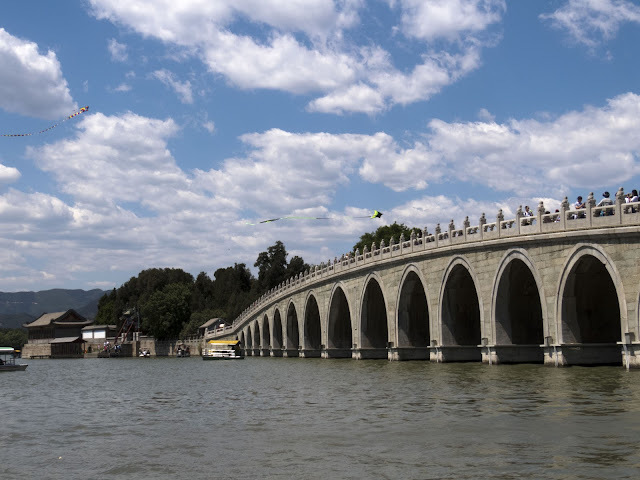 Today, residents of Beijing flock to the Summer Palace by the thousands for a weekend getaway. 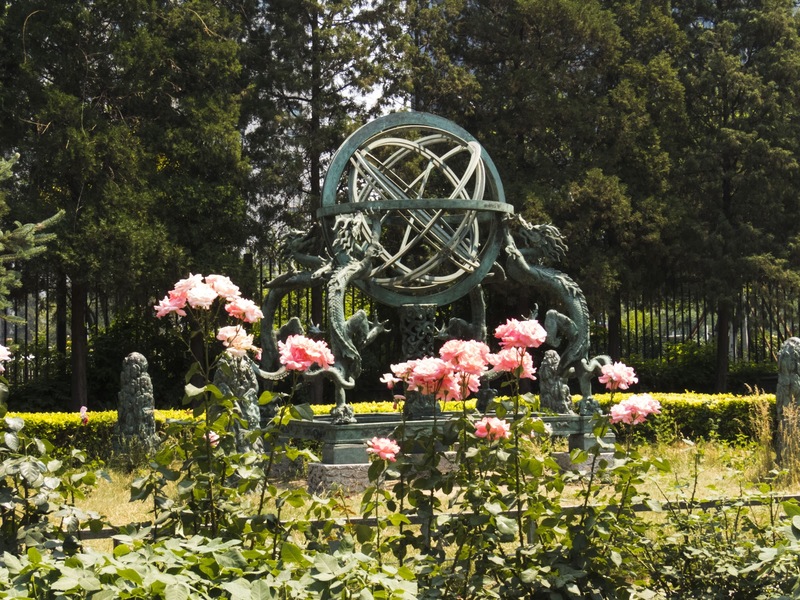 To get to the Summer Palace, take the metro to Beigongmen Station. I remember looking up to the sky soon after we arrived on the shores of the lake. The most beautiful kite I've ever seen was flying high above us. As we stood and watched, the kite rose higher and higher until it was finally touching the clouds. Crossing the Shiqikong Bridge to Nanhu Island, we spotted a crowd gathered around this gentleman. We were impressed by the tremendous wheel of kite string that he was expertly feeding out. Well played, sir! 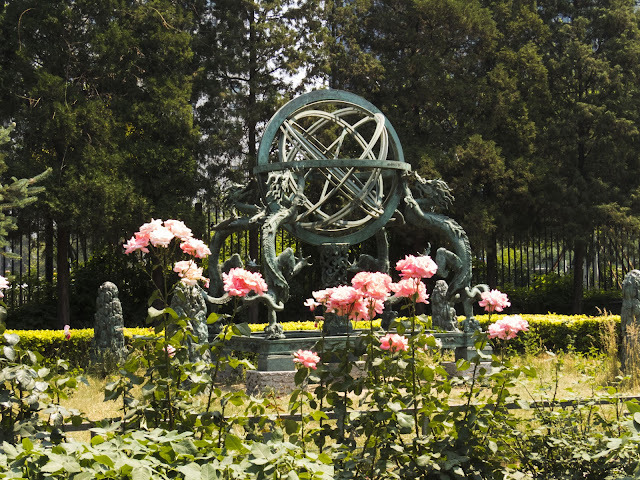 The Summer Palace is also home to the Marble Boat or The Boat of Purity and Ease. Built in 1755, the Marble Boat is now a pavilion on the lake. The Long Corridor along the lake at the Summer Palace features nearly a kilometer of richly painted columns from the 18th century. Suzhou Market Street recreates the ancient shops of Suzhou China. 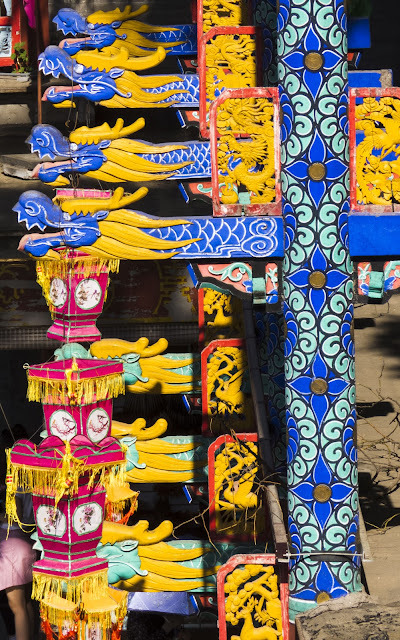 I was particularly impressed by the colorful dragon decorations. Tiananmen Square, the beating heart of communist China, is also easily accessible by public transportation. 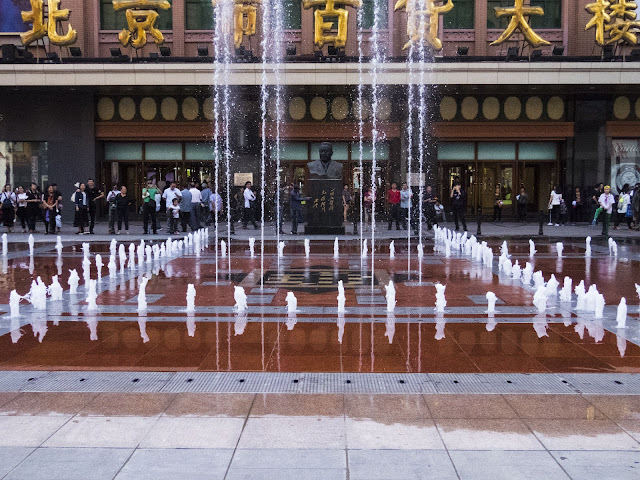 The square is so big that there are two stations running along the top near the Forbidden City and another at the south end: Tian'anmen East, Tian'anmen West, and Qianmen stations. A giant portrait of Chairman Mao presides over the square. 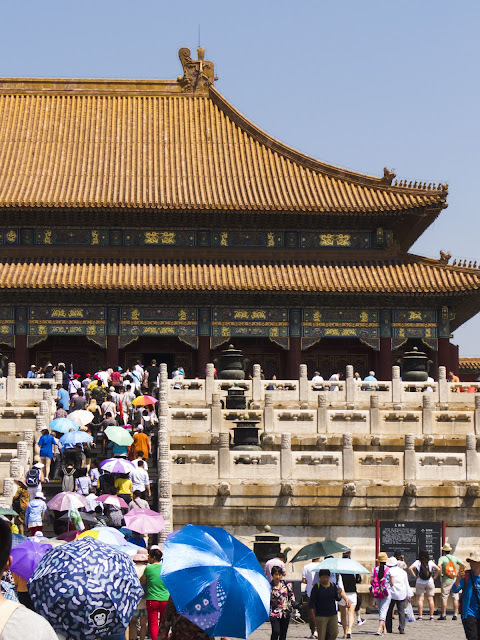 Tiananmen Square is also the gateway to Beijing's Forbidden City. 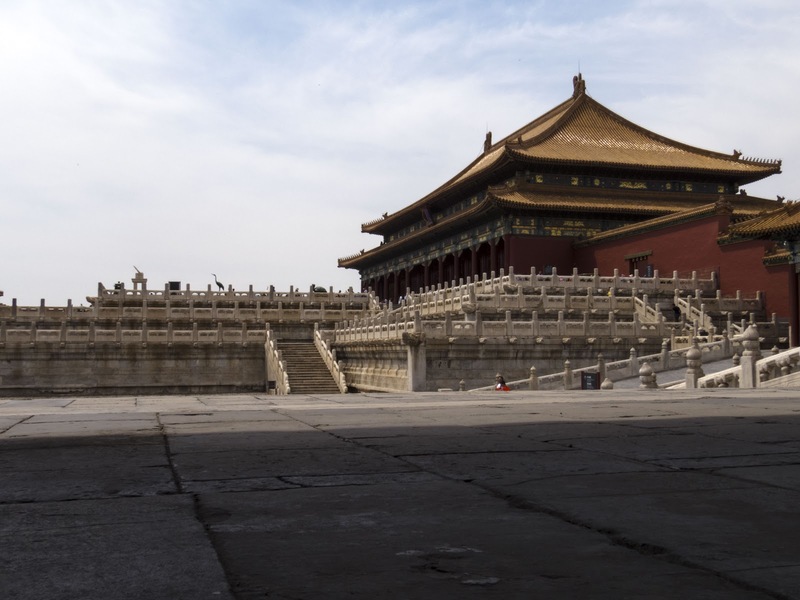 We spent half a day wandering around Beijing's Forbidden City. We admired the golden roofs of the temples. The Forbidden City was quite crowded when we visited so we spent a fair amount of our time elbowing our way in and jockeying for a position near roped-off temples to see what was inside. The Forbidden City also features a museum of historic clocks which you can access for an additional fee. We thought it was worth a look. We stayed at the Beijing Marriott City Wall Hotel which was conveniently located within walking distance of Jianguomen subway station. 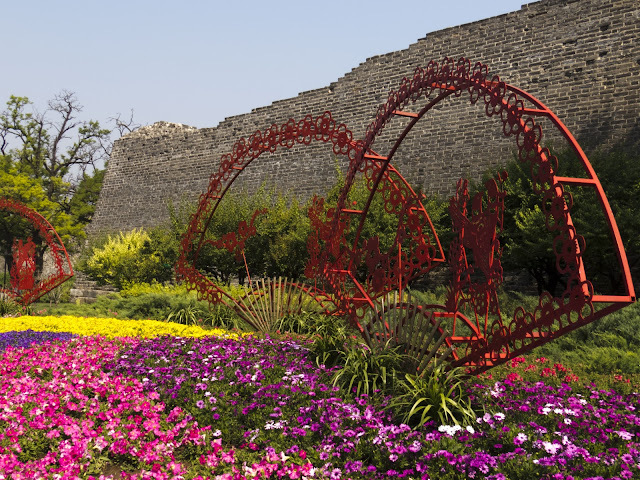 Jianguomen station is the gateway to the Old City Wall. 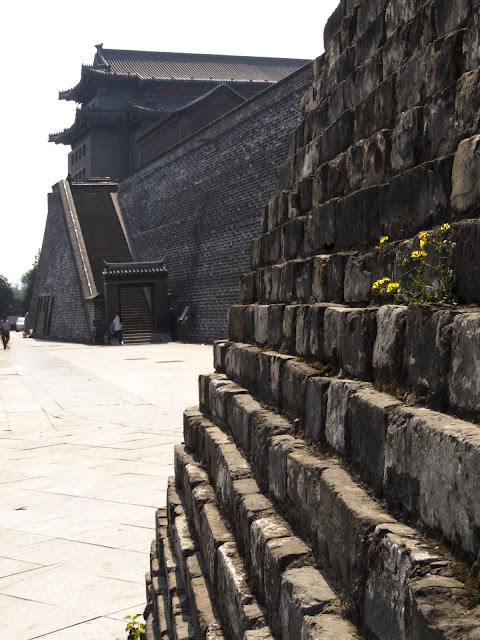 We spent some time walking in the idyllic park surrounding the Beijing Old City Wall and paid a small entry fee to climb a restored section for views over parts of Beijing. Wangujing is Beijing's upscale shopping street. Accessible via Wangfujing Station on the metro we enjoyed window shopping and people watching. We also stumbled upon a fascinating free fountain show outside the ornate Beijing Department Store. Wangfujing Snack Street lies just off of the main thoroughfare near the station. We visited in late afternoon and the food stalls were already buzzing. We saw all manner of Chinese delicacies including scorpions on a stick. Some of the scorpions were still wriggling. I couldn't bring myself to try one. 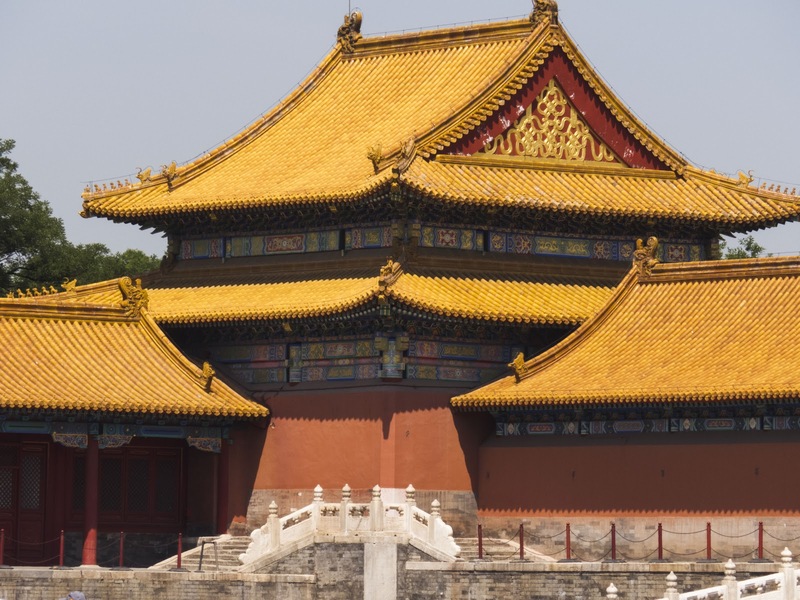 Beijing is known for a variety of beautiful and tranquil temples. On our last day in Beijing we commuted by train to Yonghegong Station and the Lama Temple, a vibrant community of Tibetan Buddhist monks. 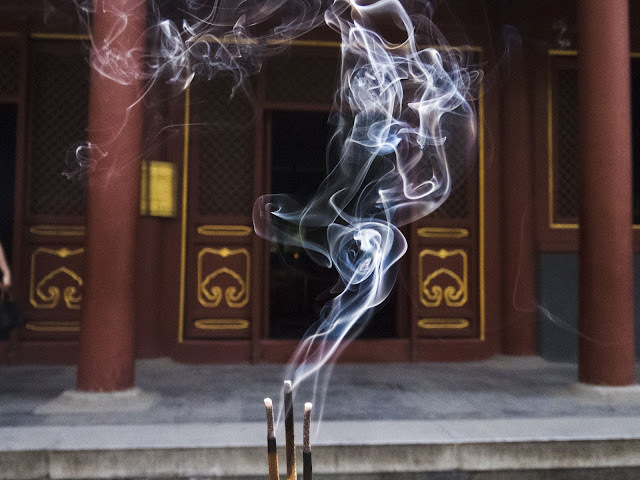 Also known as the Yonghe Temple, you pay a small entrance fee which includes a large pack of incense and a DVD about the temple. 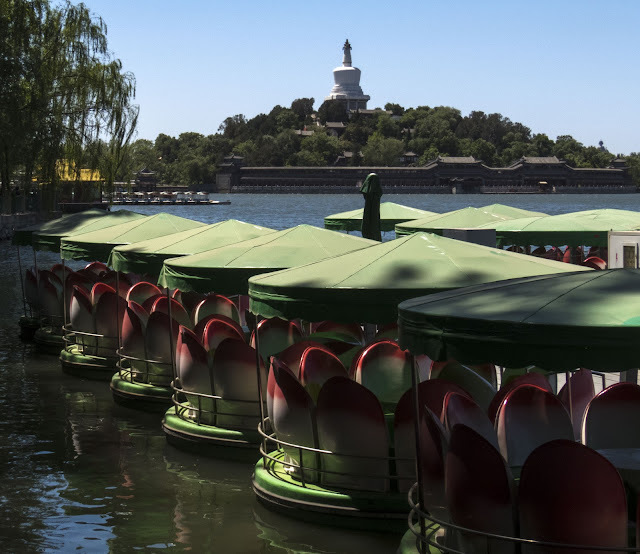 We took a leisurely stroll, lit some incense, and steeped in the idyllic surroundings that felt far from the chaos and crowds of Beijing's streets. Dongzhimen Street, also known as Ghost Street, is know for Hot Pot restaurants. Most of the restaurants are located between Dongzhimen and Beixinqiao stations on the metro line. The language barrier was often a problem for us at restaurants in China. We could usually get by pointing at picture menus, but in the case of hot pot, there is more to ordering and preparing the food than that. We got really lucky and found one restaurant where one employee spoke a tiny bit of English. It was enough that she was able to help us order through the tablet based system that the restaurant employed. Our helpful waiter didn't speak English but he proactively jumped in and helped us to cook our food. We had an amazing time cooking our meat and veggies in a mixed broth (one half was mild and one half was fiery hot and spicy). Our hot pot experience in Beijing was one of our most memorable meals in China and we were able to get here independently thanks to public transportation. We stayed at the Beijing Marriott City Wall Hotel which was conveniently located within walking distance of Jianguomen subway station. When visiting Beijing, definitely take care to find a hotel convenient to public transportation. It will make getting around by subway so much easier. Check out the map below to see the spots that we visited and associated metro stops. Explore Beijing by public transportation. Take Beijing Metro to various points of interest. 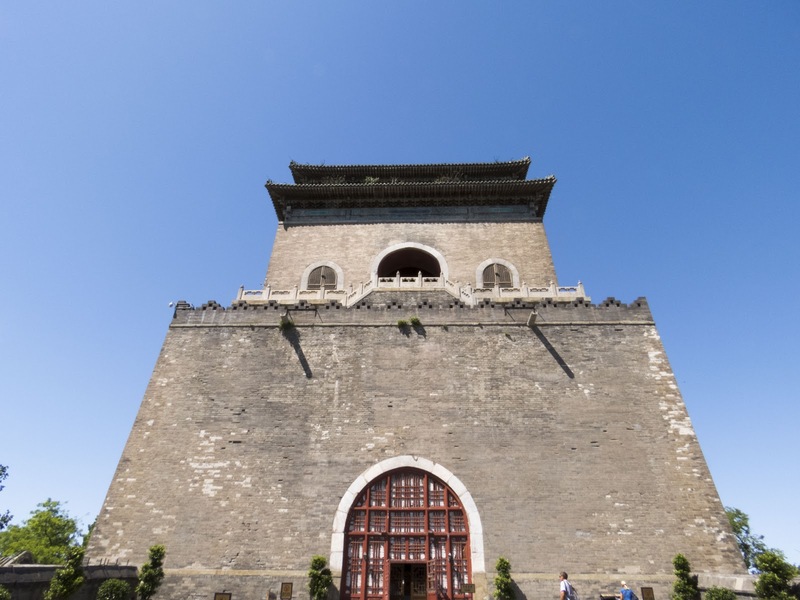 Discover what to eat in Beijing China and fun things to do that are accessible with a Beijing public transportation smart card.